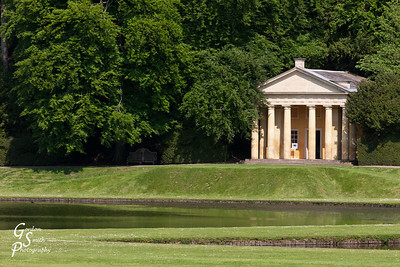 The largest part of the United Kingdom, this gallery includes the spectacular Peaks District, Chatsworth house, Fountains Abbey, Whitby Abbey, Bempton Cliffs, the Duddo Stone, Nine Stones Close, Stonehenge and Beachy Head. 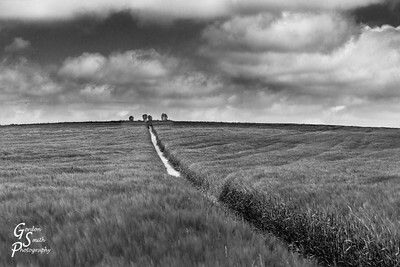 Duddo Stone Circle in black and white with threatening clouds. 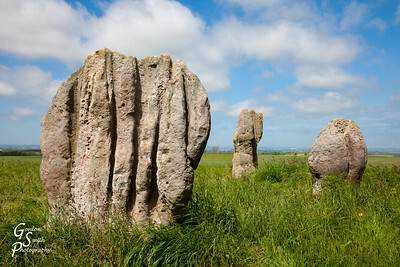 Duddo Stone Circle. 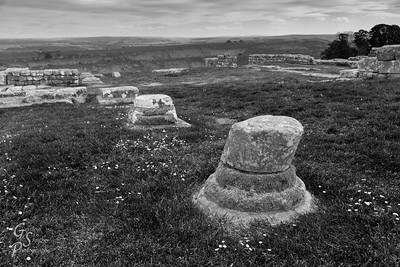 The Duddo stones are 4000 years old. They have unique vertical scars or grooves. Their purpose is unknown, of course. 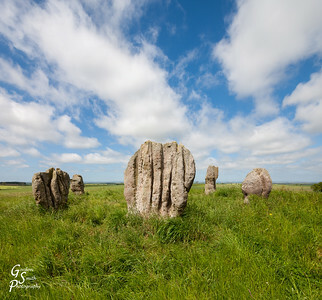 I loved seeing a stone circle I could have completely to myself with my family. 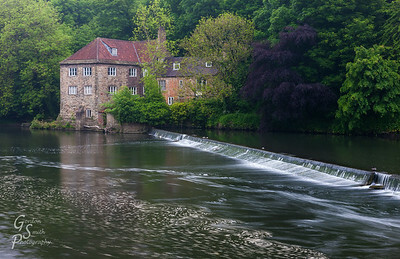 What an enchanting location. 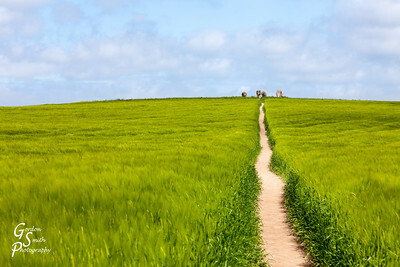 Duddo Stones in a Field with distant yellow rapeseed and wonderful blue skies. Duddo Stones Detail: 3 of the 5 Duddo stones are seen in this photo, but it shows the deep groves in more detail. Each stone is unique. 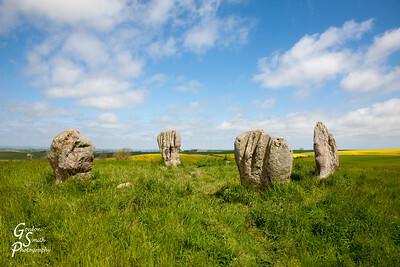 Duddo Stone Circle on a Hilltop. A 5th stone is hidden behind the largest stone. 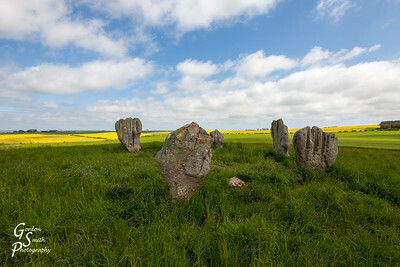 These 5 stones form a picturesque circle in the remote corner of England. 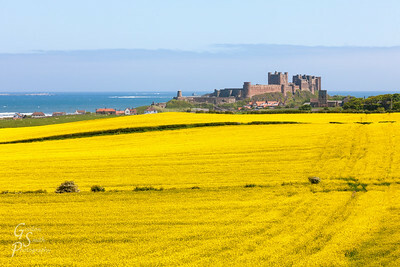 Bamburgh beach and Rapeseed Field: This amazing glorious view of Bamburgh Castle has a wonderful yellow field of blossoms, flowers and the distant cold blue Atlantic Ocean. 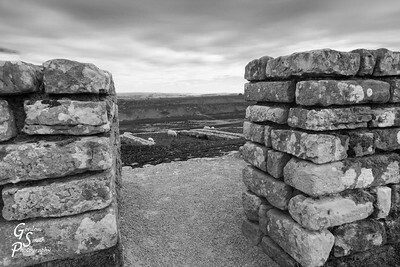 Hadrian's Door: a door in the Housesteads Fort along Hadrian's Wall. 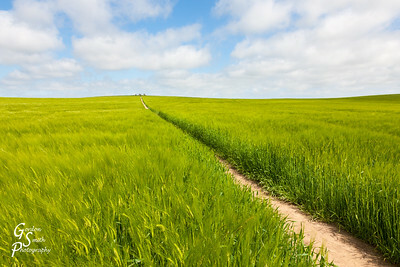 Sheep graze in the center of the photograph. 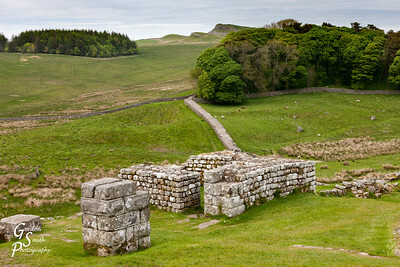 Hadrian's Columns stand only a foot or so tall but they are a few of the remains of Housesteads Roman Fort. A few small flowers grew here and there. They show up well in this black and white photograph. 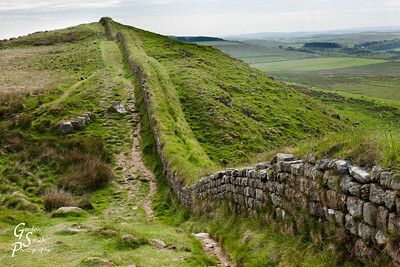 Hadrian's Wall and Woods. 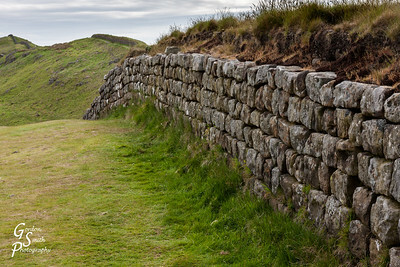 The wall extends into the verdant woods. 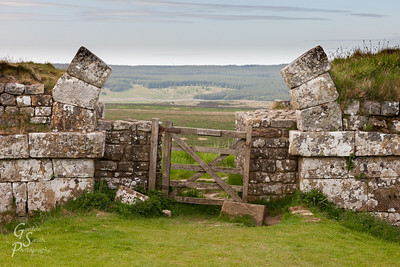 Roman Arch along Hadrian's Wall: A broken arch and gate along the great wall build by Romans. 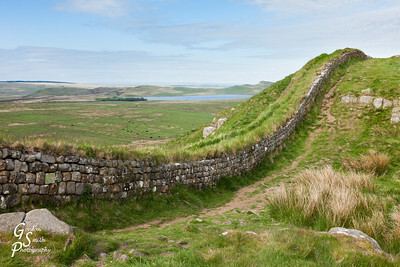 Hadrian's Wall extending over hills and peaks. 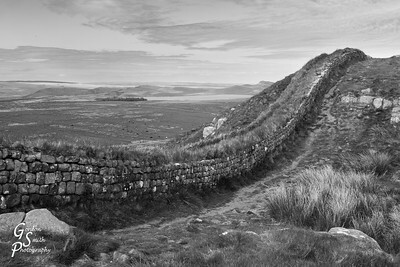 Hadrian's Wall at Steel Rigg undulating snake-like over the hills and bumps. 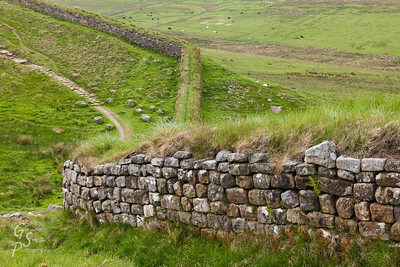 I love hiking along this part of the wall. 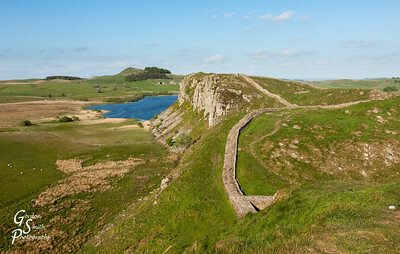 Steel Rigg and Hadrian's Wall: a classic scene along this most-beautiful section of the wall. 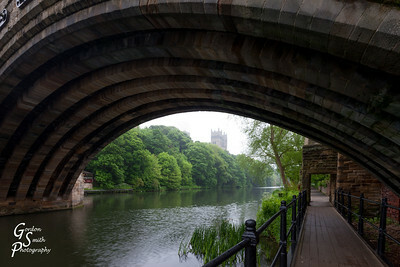 Seeing under Prebend's Bridge in Durham, England. 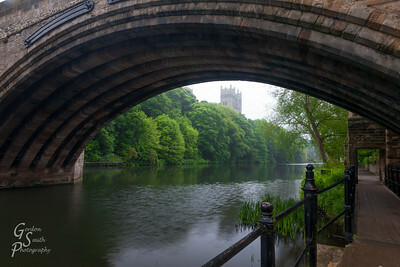 Durham Cathedral, River Wear: Durham Cathedral hides in the reflection of the murky waters. 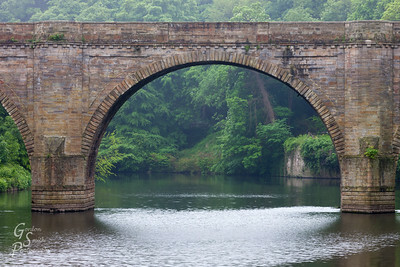 Framwellgate Bridge in Durham with a pedestrian walk under the oldest bridge in the town. 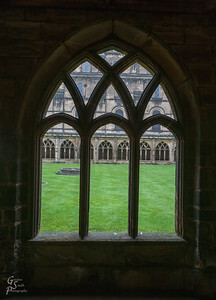 Durham Cathedral Cloister Window looking out onto the lawn. 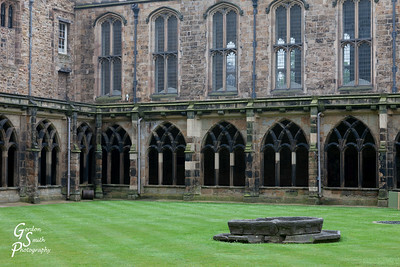 Durham Cloisters of the Norman Cathedral, the best in all of Europe. 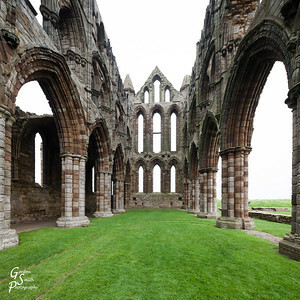 Whitby Abbey Ruined Shell standing over Whitby town and harbor on the northeast coast of England. This ruin is infamous for one thing: Dracula's attack on Lucy occurred right here. The vampire spirit still haunts this spooky place. 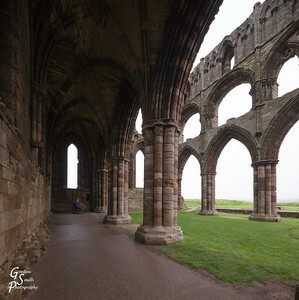 Inside Whitby Abbey Ruins on a foggy day. 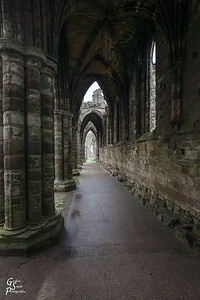 Whitby Abbey Corridor: Exploring this amazing ruin is so awesome if you are a fan of Bram Stoker's incredible novel Dracula. 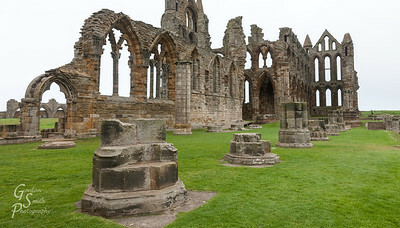 Dracula's Whitby Abbey: a ruined abbey standing over the town and harbor of the same name. This is an awesome place to visit. It makes the novel Dracula come alive to visit. 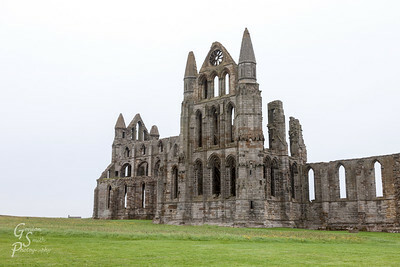 Whitby Abbey East Face is highest and most intact. This gets the harsh winter winds from the North Sea. 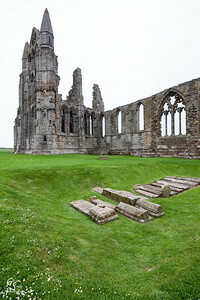 Whitby Abbey Graves: I would not want to be buried here at the location known for vampires. Puffins of Bempton Cliffs come primarily in the months of May and early June. 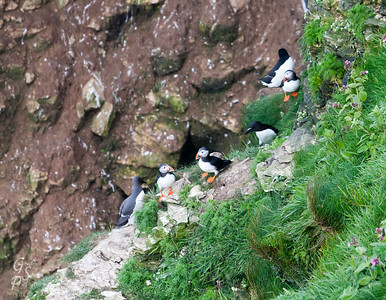 Here are three puffins enjoying a blustery cliff with numberless other birds. 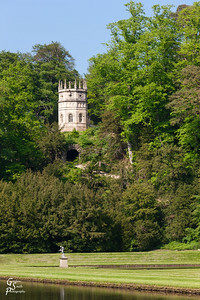 Fountains Abbey Octagon Tower on the hill overlook these marvellous grounds. 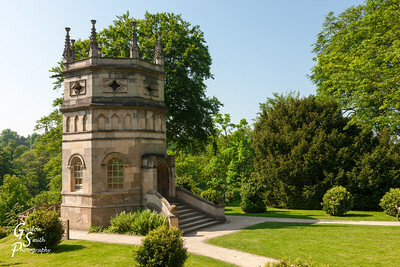 Fountains Abbey Tower in the octagon shape. 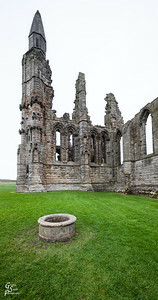 You can visit the whole garden and ruined abbey throughout the year. 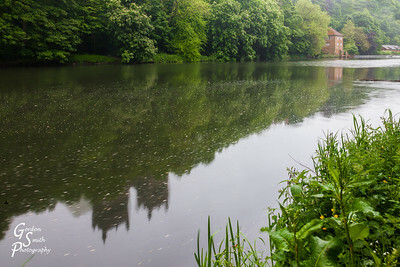 A leisurely walk along the pond is great on a sunny day. 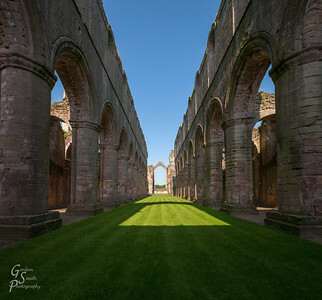 Fountains Abbey Main Hall with massive columns. 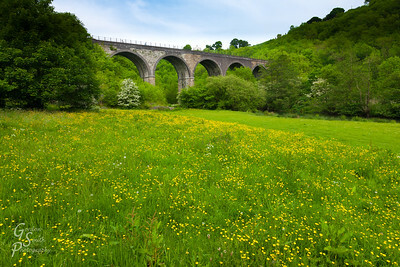 Monsal Head Viaduct in the Peaks District is historic, beautiful and playful. Now bike riders whiz across. 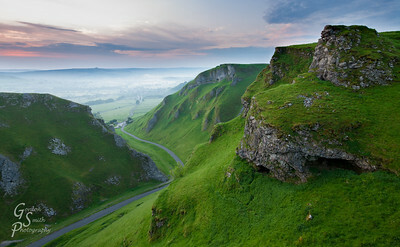 Winnats Pass at Sunrise is a wonderful place to spend some time. This deep gorge reminds me of Hawaiian canyons because of it's steepness and greenery.